A federal fishing ban has been lifted for more than 5,000 square miles in the Gulf of Mexico along the Florida Panhandle. That includes waters from Pensacola to Cape San Blas and extending south into the open Gulf. National Oceanic Atmospheric Administration Administrator Jane Lubchenco (LOOB'-chihn-koh) said Tuesday that no oil has been observed in those waters since July 3. She says fish caught there haven't shown any signs of contamination, though testing would continue. Federal waters west of Pensacola remain closed. 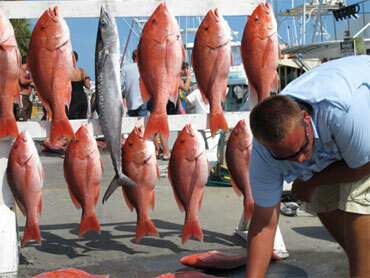 Large swaths of the Gulf have been closed to fishing since the April 20 explosion on the Deepwater Horizon. NOAA reopened waters off the Florida peninsula last month.